Day 1136 - April Eve! I am running a bit late, and I even got up a few minutes early! So long March, Hello April! Did you plan any April fools pranks for tomorrow? When I realized it was the last day of March, I needed to go online and do some banking and pay my credit card bill. 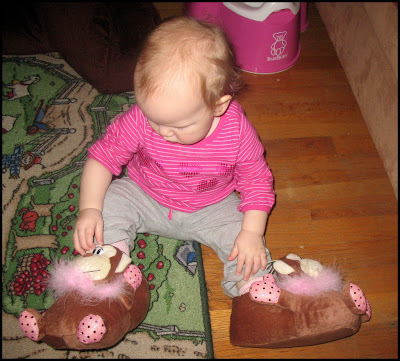 Here is a cute picture of Savannah, inspecting her toy giant animal feet. Funny! It just didn't sound right to say 'Savannah has monkey feet'. Ha! Gotta go! Have a nice end of March! TTFN! 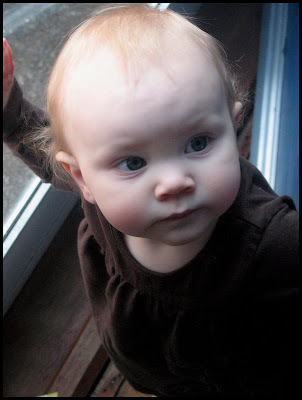 Here's a cute photo of Miss Savannah, looking like a 'wee elf', I think. Speaking of Irish, I made lamb stew yesterday, and we invited Buddy Joe to come and have lamb stew and cornbread with us. Why Lamb Stew? Well, I was going to make beef stew, but boneless leg of lamb was on sale when we went to Wal-mart for groceries after swimming, so lamb won. I put red potatoes, turnip, onions, carrots, celery, and green beans in it, as well as a carton of beef broth and a carton of vegetable broth, garlic, bay leaves, etc. It made about 2 gallons of stew. Hey Mom - I bought white turnip rather than yellow, they are easier to peel! Charlie is happy there are leftovers, so he can have them for lunch this week. 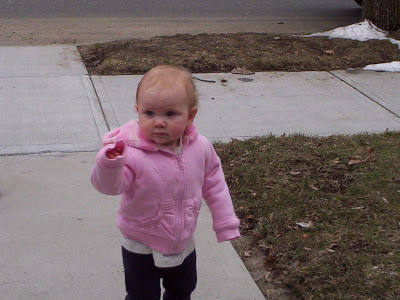 Here's a big hug from Savannah - I love this picture! Where do YOU want to spend eternity, in the Smoking or Non-Smoking Section? Yes, I admit it. I didn't get on the computer yesterday AT ALL. I went to water aerobics, then Target, then home for housework and laundry, and then I read a book. No bloggage. The pool at the health club was cooler than usual all last week. Well, they must have 'fixed' something, because yesterday the water temp was 92 degrees! Water aerobics class was much less strenuous than usual, because they didn't want everyone to get overheated. Charlie and I are going to check it out this morning. Heather, I hope you and Savi are getting some sleep! TTFN! You know what to do - march in a circle chanting 'Fri-day! Fri-day! Fri-day!' That's right! Buddy Joe - please post a comment today on your 'Cajun Steamer' experience last night. From MY perspective, it was one of the best meals ever! 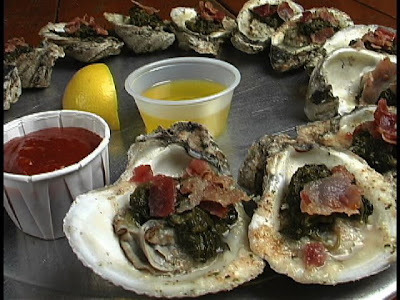 The photo today (stolen off the web) is similar to, but not a perfect match for the Oysters Rockefeller at Cajun Steamer - too much bacon in the photo. However, the Oysters Rockefeller last night at Cajun Steamer were the BEST I have ever had, bar none, better even than ones I've had in Florida. They cook them on the GRILL, which gives them a charred, smoky flavor that is just unreal. I also ordered an oyster po-boy, so I had all oysters all the time. Charlie and Joe both ordered boiled crawfish and Gumbo Ya-Ya on the side - and were also happy with those. Gotta go! Have a nice weekend! 1131 - Groundhog day? It keeps happening! Greetings, Bloggies! It's Friday eve! Here's another picture of Savannah from her birthday weekend. 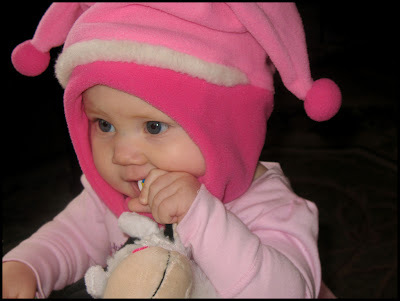 Yes, I got her that jester hat, thank you for asking. She is soooo cute! We're meeting Buddy Joe at the Cajun Steamer for dinner tonight after we work out! Hooray! There are still SOOO many things on the menu I haven't tried! I told a girl at work that we had gone back there for the third time. She said I might need therapy. I 'might' mention we are going AGAIN tonight. But first, I need to go buy gas for the car, work all day, and go to the health club to work out! Here's Miss Savannah with a really cute grin. I'm grinning too - because Charlie and I WENT BACK TO THE CAJUN STEAMER RESTAURANT AGAIN. That makes three times within a week. Oops. AND, it was Happy Hour! They had pint sized (beer glass) margaritas (frozen or on the rocks) for $1.99. YUM-O! Hey, Buddy Joe - where are you? You need to meet up with us, Thursday or Friday after work!!! Charlie had coconut shrimp with a side of cajun fried okra (really fresh tasting), and cajun mashed potatoes (yummy also). I had the cajun salad, which comes with fried crawfish and shrimp on top. However, I asked for some fried oysters as a substitute, and my salad arrived with fried oysters and shrimp on top. Just what I wanted. The fried oysters there are so good! I am going to have to order more of those. It is going to take a LONG time for us to work through all the menu options, but I am looking forward to the challenge! 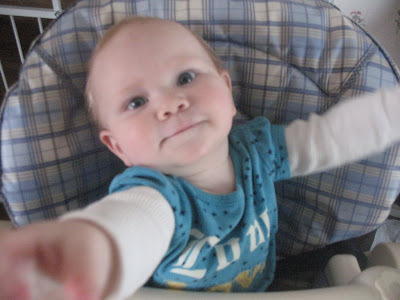 Day 1129 - No time for bloggage! The alarm goes off and Charlie and I just turn it off and go back to sleep! 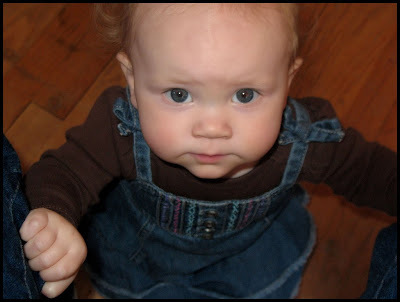 Here's a cute photo of Savannah for you to look at, and you can talk all you want to in the comments. I bought 'Grand Ole Opry' tickets last night for Mom and Gil's visit. I got GREAT seats on the floor, section 2, row E, on the aisle. Day 1128 - Monday ALREADY? Savannah is 'truckin' in this photo too. Yesterday I did housework, laundry, ran errands, and made a trip to Trader Joes (still a favorite!). I need to leave ASAP for work so I can get some things done before my 8am meeting. Day 1127 - Been to Jersey and back again! We had such an excellent day yesterday! I went to water aerobics first thing in the morning, stopped at Sams Club, then came home to get ready. We left around noon or so to go to TPAC. We didn't have traffic or parking issues, so we had time to tour the Tennesee State museum on the lower floor of the TPAC building! The museum had everything from Mastadon bones (including a jawbone with teeth!) found nearby in Williamson County, also tools and arrowheads and ceremonial carvings from native Americans here. They had examples of pioneer dwellings and life, and a lot about President Andrew Jackson who lived here (did you know he killed someone in a duel for insulting a woman?). After that, we went upstairs (literally LOTS of stairs in that building) to attend our matinee performance of the Jersey Boys. It was excellent! Lots of music, and a good story too, even sad in parts. They even did the New Jersey accents and 'full of swears Jersey dialect'. We had a great time, and it was over too soon. Of course the 'Frankie Valli' star was WONDERFUL. TY and SY bought the cd and will make me a copy. Then off to Cool Springs, stopping at Academy Sports for a quick shop, then to the Cajun Steamer restaurant (yes, again) for dinner. We had to wait an hour, but it was worth it. We made friends with another party of four, and they ended up sitting with us at a big 10-top table. We told them about Papa Boudreauxs, and they promised to try it sometime. I had a hurricane (New Orleans rum drink), fried alligator for an appetizer, a cup of Gumbo Ya Ya (that means it has everything in it), half an oyster Po-Boy, a side of red beans and rice, and beignets with coffee ice cream for dessert. Yes, I ate ALL of that, I did not take anything home in a box. Charlie helped with the alligator and the beignets. He had crawfish etouffee and black eyed peas. SY and TY had blackened grouper fingers, seafood casserole, red beans and rice, seafood stuffed catfish, and shared a bread pudding. Whew! I'd better go get some exercise and burn off some of that food! TTFN! 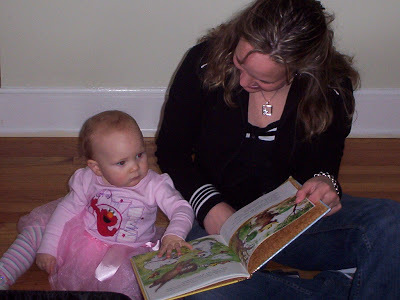 Here's a cute picture of Heather and Savannah 'reading'. That reminds me to send my sister Lyn some books, too! Charlie, myself, and our friends TY and SY will be going to the matinee performance of 'Jersey Boys' at the Tennessee Performing Arts Center (TPAC) today. going out to dinner afterwards! But for now, I'm getting ready for water aerobics, I am typing the blog in my bathing suit. Heather - have you taken Savi swimming yet? Get pictures! Day 1125 - Happy Spring! 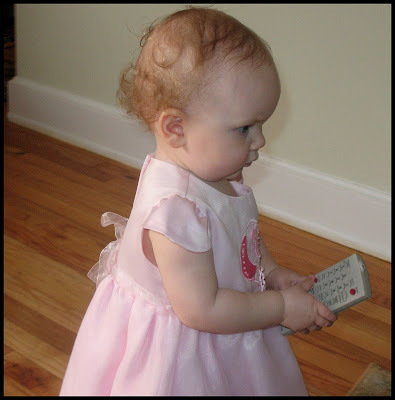 Here is a sweet picture of Savannah, concentrating on working the remote. She has such a determined look on her face! Heather mentioned that Savi has started climbing - good luck chasing her around! Today is the first day of spring, and the temperature here will zoom up around 30 degrees during the day. Charlie and I checked out a new Cajun restaurant in Cool Springs. We were very happy with the food and the prices. We'll need to go there many times to try everything that looked good! Come on, I know you're hungry now... admit it! Day 1124 - Thursday already? Here is a picture of Savannah in Heathers lap. Heather is biting her nail because it had gotten long. I think her expression is adorable. She's not quite sure what is happening, but she's getting snuggled so it must be all right! I can't believe it is Thursday - this whole year has been FLYING by. On Saturday, we're going with TY and SY to see the musical 'Jersey Boys'. 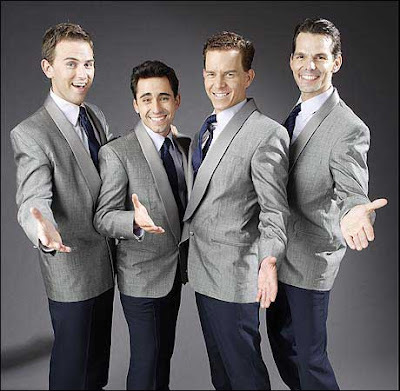 Jersey Boys is the story of Frankie Valli and the Four Seasons, with LOTS of their hit songs. My tickets were a surprise birthday gift, so I've been waiting for this for two months! Thank you, Charlie, we'll have an awesome time, and it's in just TWO more days! Afterwards, of course, we'll be going somewhere out to eat, and that will be fun too! Have a great Thursday everyone! Tomorrow's Friday! I am running really late - Charlie and I fell back asleep after the second alarm and overslept by half an hour! That puts a serious cramp in my 'getting ready for work' time. 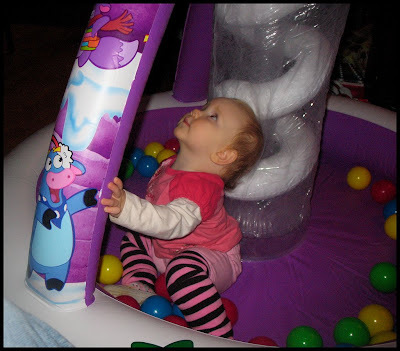 Here's a nice photo of Savi, playing in the yard (and one of her birthday toys). Day 1122 - Sham-Rock On! Are you wearing green to work today? I don't have a lot of solid green clothing, I have some olive green on. Somewhere I have a green fleece jogging suit jacket, but that might be too hot for work. It's going to be in the 70's today, by the way. I was in London once on St. Patricks Day and saw some of the St. Patricks Day parade. The noise of the crowd was more of a turn off than a turn on for me, so I didn't really 'participate'. They also have a heck of a St. Patricks Day celebration in Denver, if I recall correctly. Two of my nieces have birthdays this week. Their birthdays are just a couple days apart, so I always send their cards at the same time. Happy Birthday, Allison and Emily! I am going to be a great-Aunt around Thanksgiving time this year. I know, I'm already a 'great' Aunt. I keep a stash of greeting cards - birthday, valentine, christmas, etc. I'd better stock up; as my son says 'The family is growing!' It's about time to shop for Easter cards too. Day 1121 - Monday already? 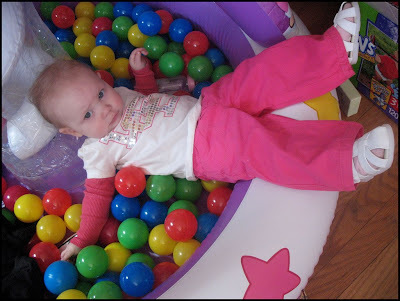 Here's an appropriate Monday photo; poor Savi - stuck in the ball pit. Cute outfit and shoes, Heather! Can grownups wear white shoes and sandals yet? Is it too early in the season? Speaking of early in the season, I already bought (on Saturday) and wore (on Sunday) a new Speedo swimsuit, purple and black. I got it at TJ Max for $16.99, and the original tag was for $80.00. I actually have plenty of swimsuits, but some of them are still put away in the closet. Meaning, I can have another one if I want to, no matter how many I already have! My blackberry is going off - there are two overnight jobs at work that send FOUR emails if they are having a problem, not just ONE email. Whassup with that? Gotta get someone to fix that. Church sign of the day (not local - I got this from the web). That reminds me of a former manager of mine. This is a true story, I am not making this up! When she took the final exams for her degree, she told me that her mother planned to spend the entire exam period on her knees, praying for her. Charlie and I spent a pleasant couple of hours with buddy Joe yesterday at the Mellow Mushroom pizza place in Franklin. Thanks, Joe! The company was great and the pizza was outstanding! Greetings, Bloggy Saints and Paddys! 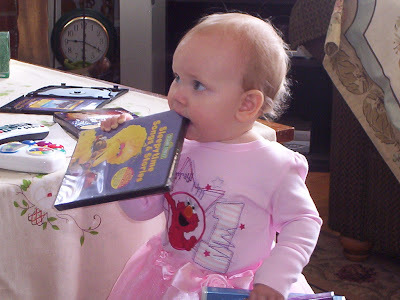 Here's Savannah, sampling a couple of her birthday videos. Delicious! 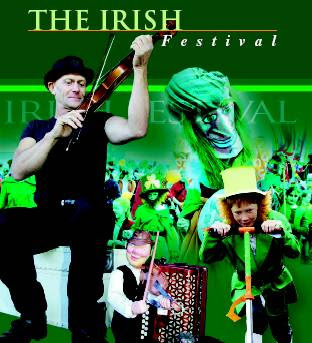 It's almost St. Patricks Day (Tuesday), and there is an Irish festival in downtown Franklin today. We are meeting buddy Joe there at 3 for a nice Irish meal - pizza at the Mellow Mushroom restaurant, which has THE BEST pizza I have had in this area. Unfortunately, it's raining, but maybe it will clear up a bit later. Mom - I am wearing the white scarf you gave me with green shamrocks on it! Speaking of green, Charlie is going to need to MOW THE LAWN soon. The grass is growing, the trees are flowering, and the forsythia bushes are blooming. The redbud trees won't be far behind. I just LOVE the look of spring! Have a great Saturday, and go Irish! Day 1118 - One year old plus one week! 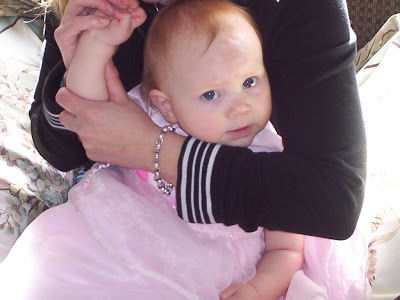 Here are a couple more adorable Savi-birthday photos. 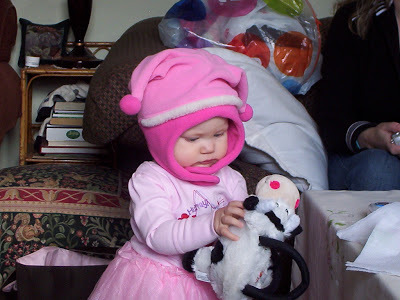 The little cow she is holding is a pocketbook that I bought for her at Opry Mills. It is just the right size! I dreamed last night that I had to walk underneath a tree that had spiders dangling from it. My little dream dictionary book says spiders in a web portend luck or great achievement. Gotta go! Have a great Friday! I am running very late, because I answered some email. 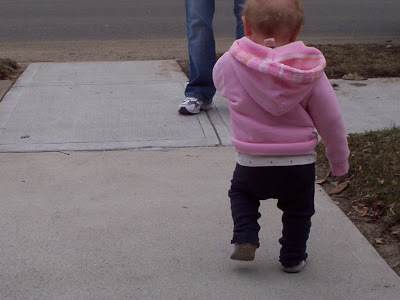 Here are a couple of cute 'walkin' pictures of Savannah and my son Evan. You can talk among yourselves in the comments. 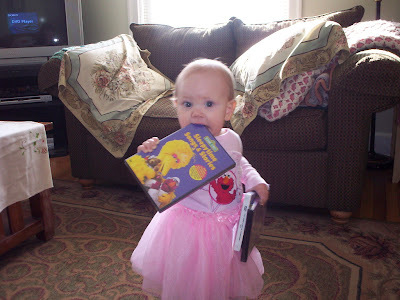 Here is Little Miss Birthday girl Savi wearing one of her birthday dresses - too cute! I love the way she wrinkles her nose sometimes when she smiles. Nashville did set a record high temp yesterday, which broke a record set in the late 1800s. 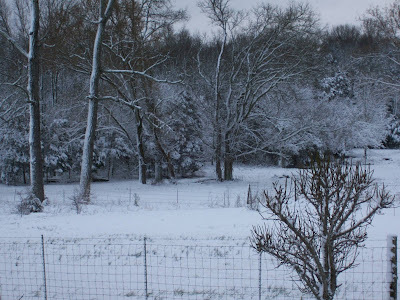 It'll turn colder all day today, and we might have a wintry mix tomorrow. Hey - did you watch Idol last night? My two faves are still Adam and Allison, and I'm sticking to 'em. I am running late because we overslept a bit. Gotta go, and have a nice day! 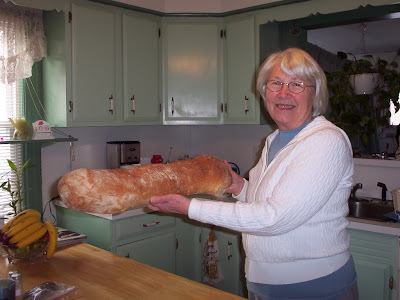 Here is my mother, holding the biggest loaf of Italian bread I've ever seen, purchased at a local bakery in Providence. It is called 'Italian french bread'. I guess because it is as long as a baguette, but thick and crusty like Italian bread. My sister made 'Chourico and beans', which is made from portuguese sausage, spices, potatoes, kidney beans, and red sauce, simmered on the stove. Crusty bread is a perfect accompaniment to soak up the delicious sauce. Read about 'chourico' if you want to. We demolished it, no leftovers... Okay, now I'm hungry and it's all my own fault. Changing subjects, we may set a record high today. It is expected to be 80 degrees this afternoon, then 40's and 50's the next several days. The pear and cherry trees and forsythias are in bloom! It's too early! 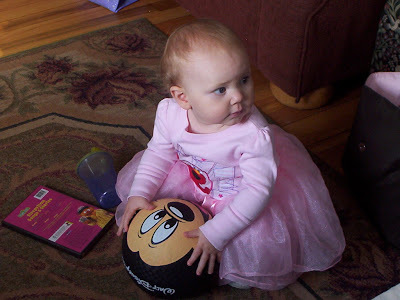 Here's a cute photo from Friday of Savannah playing with her Mickey Mouse ball. Yes, I'm back in Tennessee today - I had a smooth flight back, the plane was on time, and I read a book from start to finish in the airport and on the plane. Thanks, Lyn and Steve! Thanks, Cheryl! Thanks, Heather and Evan! Thanks, Mom and Gil! I had a great visit. Don't you love it if there is nobody in the middle seat next to you? There was a guy sitting in the aisle seat, but the middle seat stayed empty. The guy remarked 'we lucked out', when they closed the doors, so he felt the same way I did. Another airplane 'thing' - Southwest doesn't accept cash anymore for beer and wine purchases- they walk around with a handheld device and scan the credit cards and debit cards. Interesting - I wonder why they changed? Theft of cash? Another 'airport thing' - in Providence, you 'used' to have to bring your bag to the luggage scanning station, and WAIT THERE until it went through in case they had a question. No other airport had that policy, just Providence. You don't have to do that anymore. That was a pleasant surprise. Day 1113 - What? Time to go already? DID YOU TURN YOUR CLOCKS AHEAD BY AN HOUR? IF YOU DIDN'T, YOU'D BETTER DO IT NOW. We have had a wonderful weekend, but it went by so fast. Good thing I'll be coming right back for Memorial Weekend! Two glorious days visiting with Savi, and now I need to head back to Tennessee. I'll be leaving soon, have a nice Sunday! Greetings, Bloggy Birthday Celebrants - again! 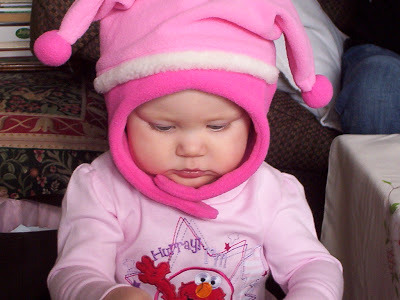 Here is Miss Birthday girl Savi wearing a hat I bought for her birthday - a pink jester hat! 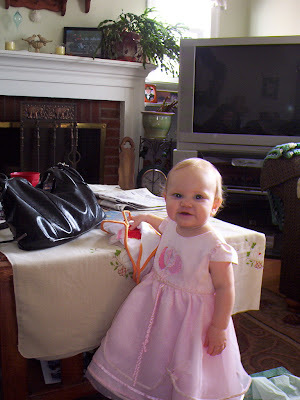 She is chewing on the tag of a plush cow pocketbook - another birthday present from 'Grammy Gigi' - that would be me. Yesterday was such a fun day, and today will be too! Hey! Did I tell you yesterday about my 'near disaster'? As soon as I turned on my camera, I got a fatal 'low battery' message. 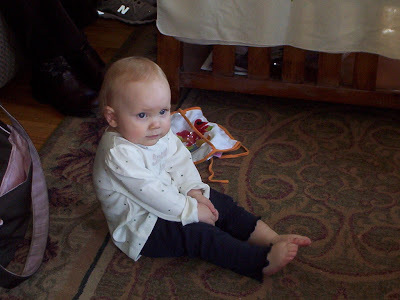 Thankfully, my sister had batteries in the house, or I wouldn't have any photos on my camera. Thanks, Lyn! The plan is to spend the day visiting with family and friends, and enjoying Savannah. I'm going to order calzone and pizza from a local pizza place (the spinach and mozzarella calzone they make is awesome), and we'll have cake too. Can you believe I already need to check in for my flight back home later this morning! I am going to set an alarm on my phone to remember. TTFN and have a nice day! I know I will! 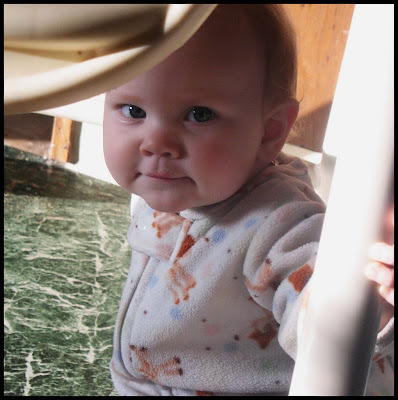 Day 1111 and Savi is ONE! Greetings, Bloggy First Birthday celebrants! Happy Birthday, Savannah! I can't wait to see you today on your birthday! In case you haven't caught on, Savannah Lynn is ONE today. Did you notice that it is my 1-1-1-1 day of blogging? How cool is THAT? 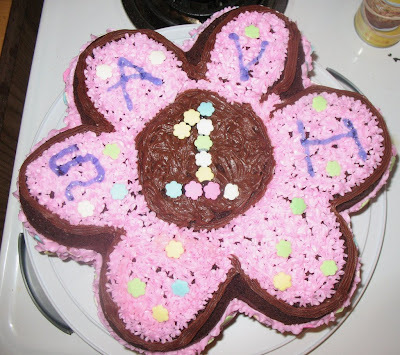 Look at this adorable first birthday cake! Awesome! I'll be spending the day with 'the fam' today, and another one tomorrow! Yahoo! Happy Birthday to YOUUUU, Happy Birthday to YOUUUU, Happy Birthday, dear Savi, Happy Birthday to YOUUUUU! Day 1110 - Birthday Eve! 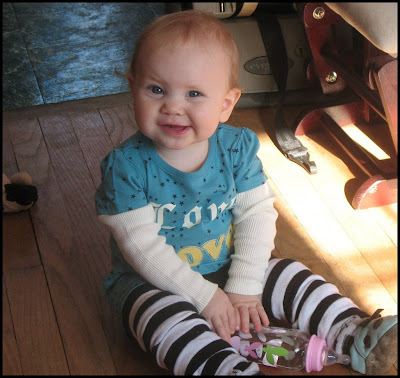 Here is our little darling, Savannah, looking like a one year old already. 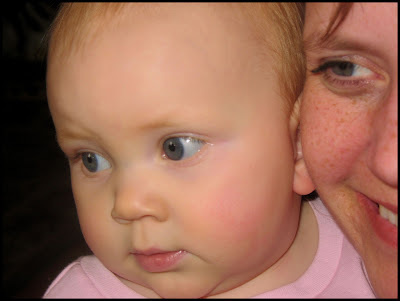 I just love this picture, her smiling face is going in several different directions at once! One eyebrow up, eyes crinkling, big grin - she's got it all going on! I'll be leaving work around 3 this afternoon to avoid the worst of the rush hour traffic around the airport. I have my favorite nonstop flight into Providence, and my son is picking me up at the airport. Catcha tomorrow from my sister and brother-in-law's house! 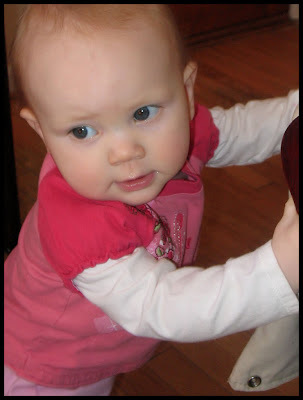 Savannah turns one year old on Friday, she is such a big girl already. This year flew by! 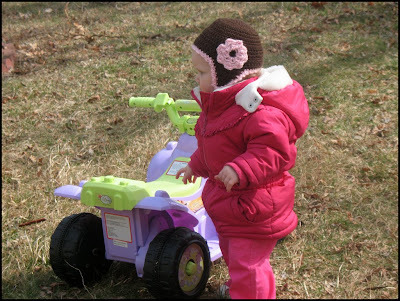 I can't wait to just watch her play, and see her walking and talking to herself and carrying toys around. Just can't wait! Have I finished packing yet? No. Do I still need to do wash? Yes. Do I have my itinerary printed? No, I printed one for Charlie, not myself. Duh. Do I have presents for Savannah? Yes! I have to check in tonight for my flight. Tomorrow I'll leave work early and take my car to the park and fly place. That's mostly what's on my mind right now, guess I'd better leave early and try to catch up on stuff at work! 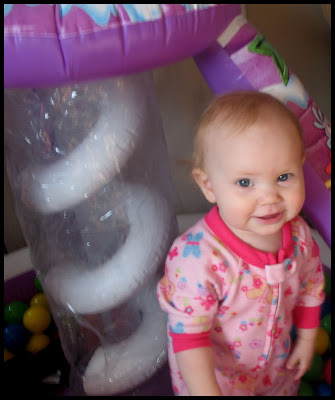 Here is Miss Savannah playing inside one of her birthday presents. Awesome! Gee, with toys like these, who needs to go anywhere else? This is pretty cool, Heather! Unreal reality TV comment - last night was the Bachelor finale. Jason proposed to Michelle and broke Mollys heart. In the '6 weeks later' show, he broke Michelles heart and said it wasn't working. She gave him back the ring. He then confessed to Molly that he couldn't stop thinking about her and wanted to make amends. We'll find out tonight if that worked or not, she certainly seemed receptive to the idea. That's a first for the show, by the way. I have a funny story from the grocery store yesterday. They had eggs on sale, both large and extra large. Almost every carton I picked up had a cracked egg in it. An older man standing next to me said 'Here - this dozen's good', and handed me his carton. I looked in it, and it had a cracked one too. I pointed that out and the man said 'Oh, is that a crack?' Too funny. I finally found two dozen perfect eggs. At the register, the register girl dropped one of the dozen on the conveyor belt, which broke one. She sent the bagger (another girl) to the back to get another dozen. I warned her in advance that they were hard to find because many of them were broken. Well, I assume 'THE DUDE' will do something about it, but it was funny to hear her call the dairy stock clerk 'THE DUDE'. 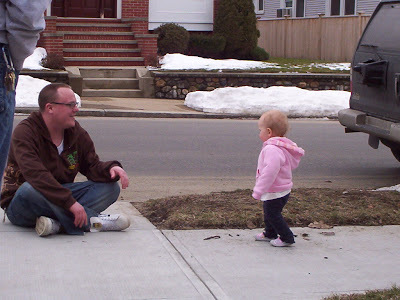 I hear that New England is getting a foot of snow from the same storm that gave us 4 inches of snow! Lucky for ME that I don't fly out until Thursday night - they should have things clear by then. 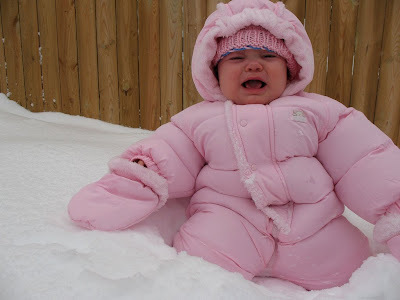 I think it's a good opportunity to post this picture of Savannah, crying in the snow, poor thing. Appropriate for a Monday, too! That's how I feel on Mondays, Savannah! Boo hoo! We did go to the health club yesterday, and we did go see 'Taken', and enjoyed it! Pretty violent, of course, but overall a good movie. Hey - what do your matinees cost? Ours have gone up to $7, and they don't give a discount off that for seniors anymore. Another memorable note from yesterday - I dropped one of my necklaces down the drain in our guest bath. I had set it on the sink to brush out my hair and my brush (not my hand, of course) knocked it into the sink. I scrambled to catch it, and tried to prevent it from slipping further in by trying to use tweezers to get it. Anyway, long story short - Charlie came to the rescue! Thank you, Charlie! He had to take out the sink stopper (not as easy as it sounds) and use his stainless steel fishing gadget to retrieve it (some kind of long clamp thing that he uses to take fish hooks out of the fish). Have a nice Monday, and be careful in the snow! I gotta go! My grandmother Lotta was born March 1st, 1908. If she was still living, she'd be 101. Happy March, but the groundhog was right, it's not spring quite yet. 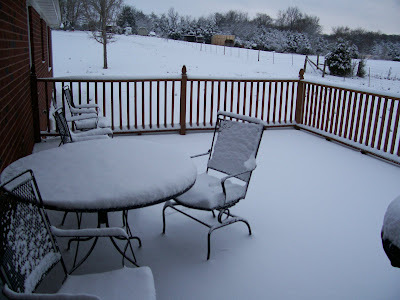 It's also windy, so the wind is blowing he snow around, but it sure is pretty! We're planning to go to the health club a little late this morning, then go (finally) to see 'Taken'. We've had a big country breakfast of bacon, biscuits with honey and apple butter, and loaded scrambled eggs. We'd better get to the health club and work that off!